Moscow. July 11. 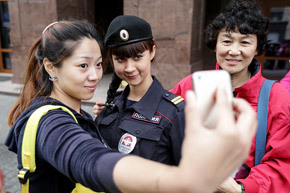 Tourists making selfy with an employee of the tourist police in the city center. The main places of service of the new police units are pedestrian areas in historical center of Moscow.